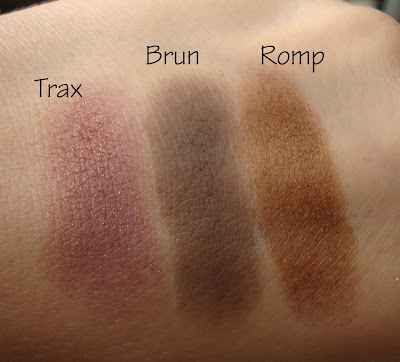 Yesterday I purchased Trax, Brun and Romp eye shadows. See below for swatches. Trax is a plum infused with tiny flecks of gold glitter. Brun is a dirty matte ash brown. Romp is a chocolate brown with a gold sheen. I had no idea romp was so pretty! nice haul! Great haul :) Love the colours, especially Trax.. any colour like that attracts me as I have green eyes! I have Romp & Trax. Trax is really pretty. great colors..have fun with them! Love brun and romp, never heard of trax! It looks really pretty with those two colors though! I know they will look great on you. These colors are going to look beautiful on you. I have to look for Romp, so pretty. I just recently got Romp myself, need to show it some love! Lol! The colors look so pretty!! I like Romp as an everyday kind of look and Brun looks great as a brow color.